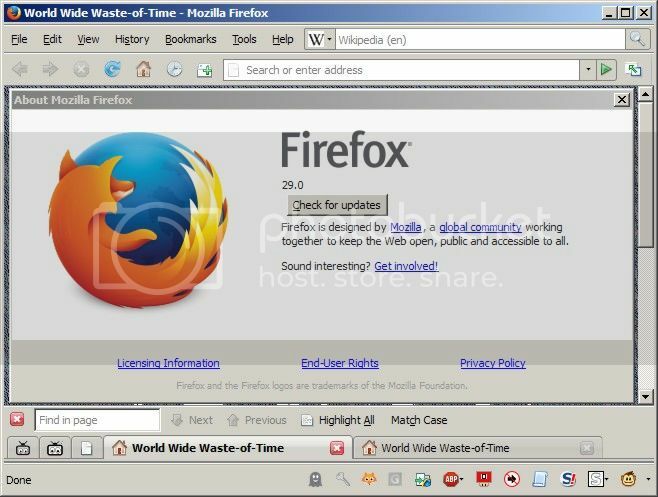 "Firefox 2, the theme, reloaded" is a theme that combines both the look of the default Firefox 2 theme (designed by Radiant Core) with the features of the newer Firefox versions. Note: I don't frequent this thread anymore. Your best bet would be to contact me on IRC or via GitHub or email. Status4Evar, oldbar, AdBlock Plus, Download Statusbar, Roboform, Stacked Inspector, Hide BookmarksBar and many more. Note: These screenshots are a bit dated, i'll upload some newer (and more) screenshots soon. Last edited by rctgamer3 on March 31st, 2017, 12:05 pm, edited 5 times in total. I'm a really big fan of this theme but it's currently acting really strangely. Over on addons.mozilla.org, 1.0.3 claims to Work with Firefox 4.0 - 20. *, and it invites download with the Green 'Add to Firefox' button. But then returns: "Firefox 2, the theme, reloaded could not be installed because it is not compatible with Firefox 20.0." Same happens for 1.0.4 (which is claiming 20.0 - 22.*). It gets more strange. I have two machines (both using 1.0.3), one where it's running happily with no warnings, on the other it's running happily but only after having brute forced it with: "extensions.checkCompatibility.20.0". The only difference I can think of is that one machine was updated to Firefox 20.0 almost immediately it became available (with no problems), the other wasn't updated for several days and the update insisted on disabling the theme as being incompatible with Firefox 20.0. Has Mozilla put the theme on some Secret Naughty Step? I do remember Mozilla trying to prevent Tab Mix Plus from being allowed for a while because it broke some (rather marginal) stuff - which is kind of ironic when new Firefox releases themselves often break stuff (<cough> Download Manager </cough>). I don't know what's going on, but i think it's a AMO (addons.mozilla.org) bug. 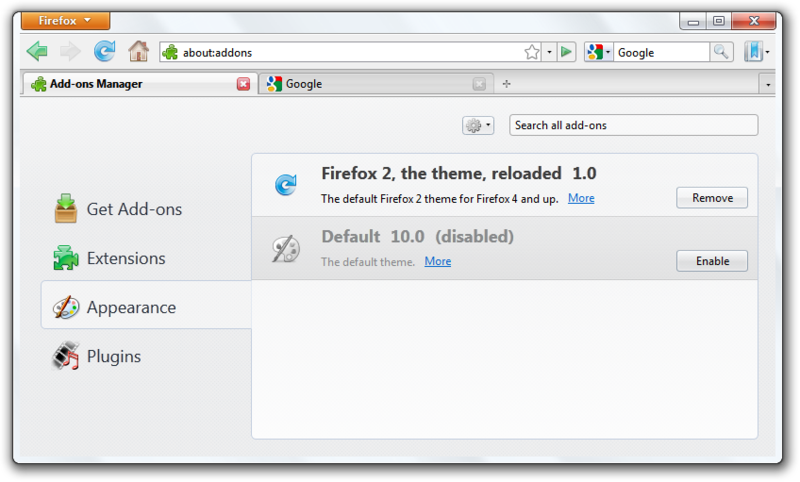 I've explicitly set the theme to be compatible with Firefox 4.0 - Firefox 21. * (version 1.0.3) almost three weeks ago and it still causes issues. Benjamin Markson wrote: Has Mozilla put the theme on some Secret Naughty Step? 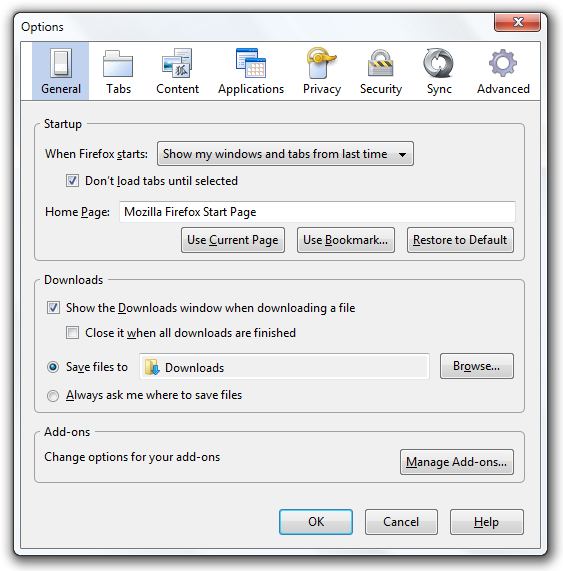 I do remember Mozilla trying to prevent Tab Mix Plus from being allowed for a while because it broke some (rather marginal) stuff - which is kind of ironic when new Firefox releases themselves often break stuff (<cough> Download Manager </cough>). It gets even stranger, because the update i submitted (version 1.0.4) was supposed to fix ALL incompatibilities with Firefox 20 (and up), but not even that version installs correctly. I've filed a bug HERE, let's wait and see what the outcome is. Or, indeed, email direct to: amo-editors at mozilla.org (I've certainly got responses using this route in the past). I've been looking at your 1.0.7 version under ff29. Firstly, I must say a big thank you for continuing to maintain this theme despite Mozilla's best efforts to "re-envision the Firefox user experience" - yeah, right. One little thing I've noticed is that there is a small breakage when using the Classic Theme Restorer add-on - I suspect this one's going to be quite popular. CTR allows you to reinstate the stop and reload buttons separate from the urlbar, it additionally allows you to hide the urlbar's stop and reload button. Doing the latter causes the spacing on the urlbar to break - when using your theme the green 'goto' arrow becomes split from the urlbar and overlays any button to its right. I note that you intend to reintroduce small icon support soon. Currently, there's a bit of a conflict between CTR's small icons option and your theme which causes custom icons to appear small while leaving your themed icons as large. To be fair, I'm seeing a lot of weirdness with icon sizes in various places with or without your theme. I think Mozilla have generally lost the plot with icon sizes, or maybe changed the plot so many times that we've all ended up on different pages. In general though, good job. So, again, thank you. This is the only theme I had installed on older versions (still using it on 24ESR), so thanks to the developer for maintaining support into our new journey called Australis. Two problems that I noticed: it is somewhat compatible with CTR though the icons like the Home button were large while others were small, and the back/forward dropdown icon was grayed out, though was still functioning. With a few tweaks this theme and CTR should be able to make Firefox look almost exactly like the earlier versions for us "luddites". In case it helps, these are the hacks I've made using Stylish - these hacks may only work for me. Now everything looks pretty much identical to how it did under ff28. @Benjamin Markson, thanks, that worked good. Now I've got this almost looking like 28. :--). The only change I made was to tighten the buttons on the Nav bar: padding-left: 4px, padding-right: 4px. There's still a problem with the CTR Back\Forward dropdown marker grayed out. You got an idea how to fix that? I'm not seeing any issues with the back/forward buttons. I'm using them undocked (Movable back-forward button) and they appear grey/green as appropriate. Is it possible that you have something else that's causing a conflict? The back/forward buttons are good. In the CTR addon there's a separate back/forward dropdown button that is typically placed after the back/forward buttons, that's what is grayed out for me, although it does work to easily go to previous sites. How did you get green back/forward buttons, are you using the CTR addon? The ones I have are black. Nope, I can't find any seperate back/forward dropdown button. I am using CTR, basically to jail break the navigation bar. My arrows are green because that's what I get with Firefox 2, the theme, reloaded. Look at the screen shots in post one of this thread. Grey/green back/forward, grey/red stop, blue reload, little pink house. Them's the icons I get. The dropdown marker button is included with CTR. If you never had it installed on the toolbar then the reason you can't find it is because it's probably grayed out on the palette. This theme is also distorting some built-in buttons like "New e10s Window", which is a new button that's in the latest nightlies but not v29. It's unusable on the toolbar. Btw, I've got the same theme as you installed: Firefox 2, the theme, reloaded, v1.0.7 but the back/forward and stop/reload buttons have not turned color as they did in earlier versions, they've stayed black. Looks like I'll be working with this for a while to sort the bugs out. Update: if the back/forward buttons are on the Nav bar they're green but if moved to the menu bar they turn black. Looks like I'll have to make more custom buttons to get it the way it was. I think you're in very different place to me. It's looked pretty much this way since I first started using Firefox with FF2. I like having a title bar, a menu bar, a status/add-on bar, tabs on the 'real' bottom, a navigation bar with separate controls, a search bar with proper labels, and a little subtle colouring on the icons. This is what I want my Firefox experience to be. I also use Downloads Window to 'fix' the downloads stuff. Definitely has that early Netscape look. Very nice too, I never thought there was anything wrong with the style, it was logically designed and straightforward. All I need here is to get the back/forward dropdown marker fixed and I'll be all set.